It was 1993 and I was a senior in high school playing running back for the South Salem Saxons. I wore No. 43 before Darren Sproles made it cool to wear the number. The Ducks running back in 1993, Sean Burwell, finished with 457 yards rushing and 3 touchdowns on the season. 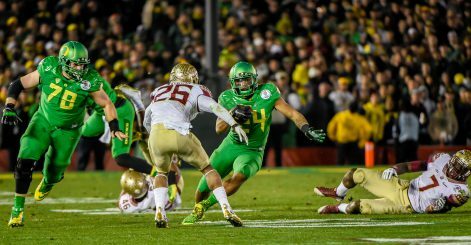 Last season, Oregon ran for 301 yards in one game vs. Florida State in the Rose Bowl. It was a different time — not only for Oregon but for offensive philosophy. In that day teams had one running back they gave the ball to 20-30 times per game and just rode. At South Salem High School, we were ahead of our time. We had two elite running backs we could rotate or use on the field together. Ok, maybe not elite, but we had two pretty fast white kids with different running styles. Coaches look, above all, for physical ability in running backs — speed, quickness, power — but running style is important, as well. My running mate in high school, Zack, was not only fast, he had great quickness and moves in the open field. He also developed a fearless shoulder shake that left defenders spun out on the turf grasping for air and blades of grass. My style was more straight-speed with power. I had no moves — just hit the hole hard and run as fast as I could. If you got in my way, there was going to be a collision — and being 5’8′ inches and 165 pounds, those collisions didn’t always go my way. However, our combined running styles made us effective and if somehow our styles could have been combined into a 6′, 210-lb frame I might be writing this article from my yacht. I blame genes for most deficiencies when I need to. 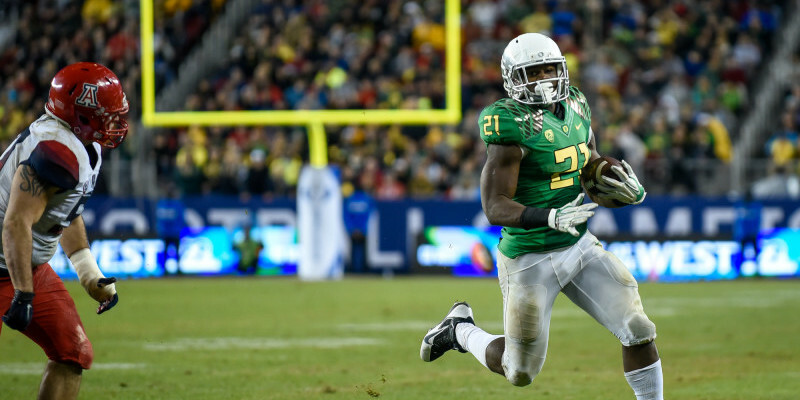 Running styles are important to the current crop of Oregon running backs. Oregon boasts not only a highly skilled group but also a wide variety of styles they will use to confuse defenders. 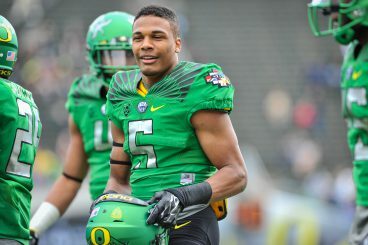 Today I’ll take an in-depth look at each runner of whom the Ducks expect to be a significant contributor this fall. This comparison is linked to other great Oregon runners with similar styles. Griffin will be a true freshman back to watch next season for Oregon and arrived in Eugene as the top ranked all-purpose back in the country. Griffin enrolled early at Oregon and was a participant in spring practice. No. 5 Taj Griffin isn’t afraid to use the whole field. Griffin’s style can best be described as a jitterbug style — full of quick moves both vertically and laterally. Griffin has incredible vision and speed and obviously played on a completely different level compared with the high school competition he faced. He consistently looks for the cutback lane and will take a running play from one side of the field to the other without hesitation. When you watch Griffin run, he seems to look to cut the run back across the field as the first option. This attribute is impressive considering most backs rarely if ever use the cut-back run at all. When James came to Oregon, he had similar size as Griffin. James’ natural instinct was to cut his runs back and use his speed and quickness to make defenders miss. When he learned to first take the ball up field and hit holes hard, he combined his newfound strength with his natural ability to become the leading rusher in University of Oregon history. James eventually added about 20 pounds to his frame to improve his power and ability to take on larger defenders. It will be interesting to see if Griffin can maintain his speed and quickness while adding size the way James was able to do. When watching Tyner, a few attributes stand out. First is his truly world-class speed. Tyner set the Oregon state high school record in the 100 meter dash at 10.43 seconds. Tyner explodes using a one-cut style. I noticed Tyner does a great job of hitting the hole hard with one-cut. Mike Shannahan’s great Denver teams made a name for themselves teaching and executing this style. Tyner is normally the back in the backfield during 3rd downs and has excellent hands. Finally, I noticed one attribute that is different than the other runners, the use of the spin move. Most backs use the spin move when a defender spins them around, normally used for survival purposes only. Still others use the spin move but with a lot less power and explosiveness than Tyner, moving laterally. Tyner’s spin move is explosive and vertical, allowing him to elude defenders and continue to move downfield. The spin move, the one-cut style, the physical frame — this comparison is compelling. Just watch the first three highlights from Smith. Smith wasn’t as fast as Tyner, few are, but the two runner’s styles are remarkably similar. Both runners have impeccable balance and get up field quickly. If not for off-field issues, Smith could have been a great professional runner in addition to his excellent although brief career at Oregon. When I watched the other runners on our list, I had a note pad. I watched their highlights on YouTube and made notes — adjectives to describe their running styles. Each runner ended up with either six or seven adjectives. 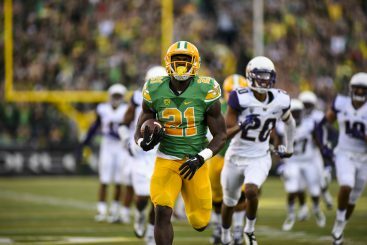 Royce Freeman breaks free vs Washington. Bottom line, this kid is a beast and there is a reason he won the job as a true freshman and will be featured on the cover of ESPN the Magazine’s 2015 College Football Preview. Freeman has incredibly quick feet for a big man and boasts uncanny field vision. When evaluating him, I found myself writing, “sees the hole early” multiple times. Freeman uses his size effectively to create power and leverage over the defender. He is not afraid to carry multiple defenders near the line of scrimmage or in the open field. This comparison presented itself early simply for the unusual combination of size, speed and power both men possess along with the fact that Freeman is the same size as Stewart during his senior year at Oregon. After watching highlights of both backs, the similarities are eerie. Both backs saw the holes early and moved with great speed and quickness. Once in the open field, both backs utilized more straight speed than cut-back ability — simply barreling down the field and using power to deflect defenders. No matter the style, the goal is the same: yards and points. This isn’t 1993 and this isn’t the South Salem Saxons. The running styles of Griffin, Tyner and Freeman will go a long way to determine those yards and points in the upcoming 2015 season.